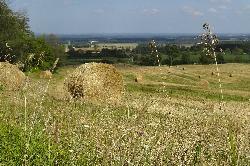 Hay field with a view. Taken along the Mulmur-Nottawasaga town line in Ontario Canada. Focused on round bale at the front of the scene. Pointing to the eastern skyline.